I’ve been going through the most recent of the more than 10,000 photos in my iPhoto library trying to rid my Mac of its burden. Yes, I have an external hard drive and do believe there are actually media files backed up there, but I haven’t checked lately. Instead, I’ve been going through old recipe shots and either deleting those less memorable, or flagging others as potentially postable sometime before the turn of the next century. Going through them reminds me somewhat of going out for a brisk three or four mile walk and then coming home to indulge myself with some neglected baked morsel neither my husband or son was willing to eat, so therefore, the duty is relegated to me. Minus a few hundred calories on the walk — plus about a thousand if I’m lucky stuffing that morsel in my mouth. I shoot and upload photos faster than I can delete them. So what is this really about you ask? It’s about that demi-glace I made. You remember, right? I froze all those cute little containers of it for future use. 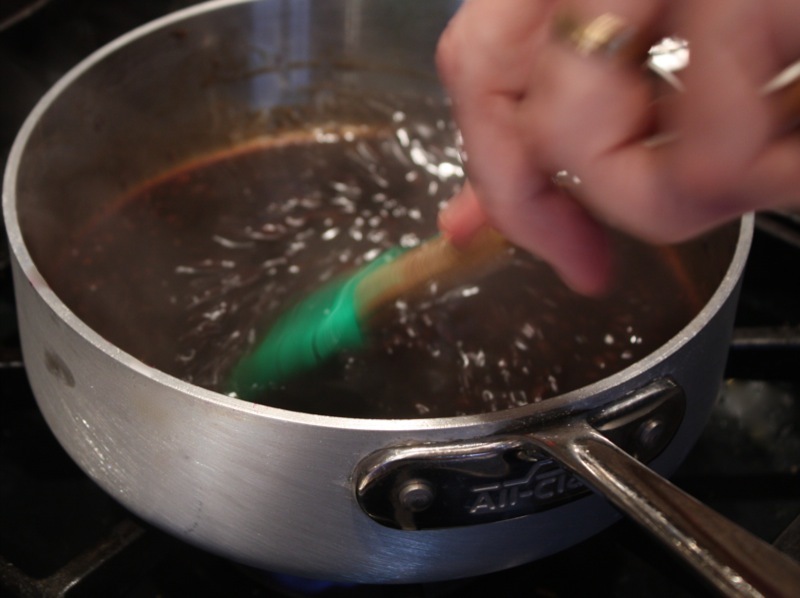 Perhaps you have nothing more interesting in your life than to wonder, “What in hell will that woman do with all that demi-glace?” Well, maybe not, but I am able to say that I have sampled two recipes with the demi-glace so far and have experimented with a third. The results are interesting, and I’m still not sure if it’s because of the high brown I inadvertently achieved on the vegetables in the initial phases of the demi-glace production, or whether it’s the recipes I’ve chosen. Regardless, I owe you a report of my progress thus far. 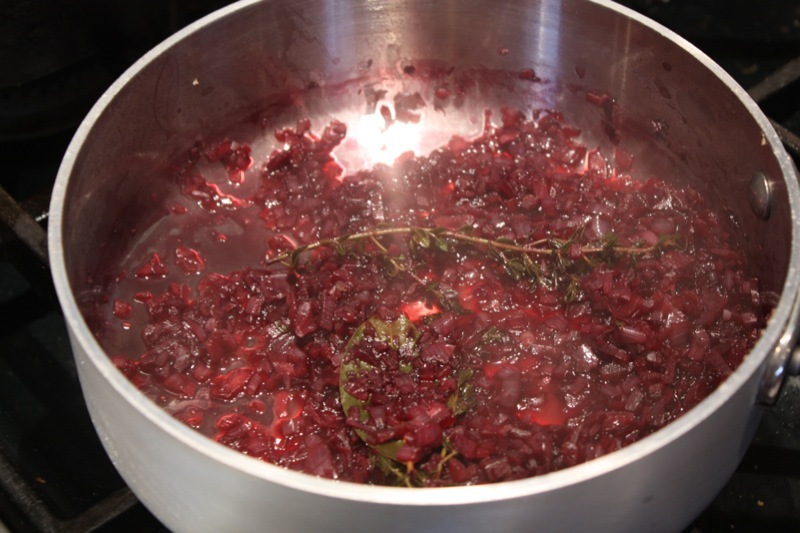 I began with Bordelaise Sauce to accompany a beef rib roast, and if I remember correctly, it was to celebrate Valentine’s Day with my mother who happens to have found the love of her life at age 71. Evidently, it is never too late. 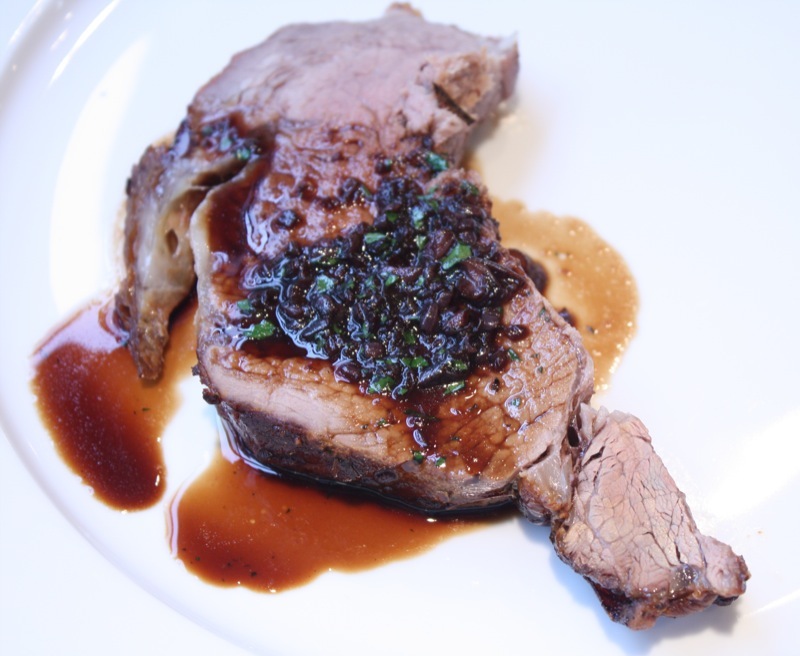 Both the recipe for the Bordelaise Sauce and Prime Rib recipes are from Saveur. The only change I made to either recipe was to use prepared dijon instead of Colman’s dry mustard which I did not have on hand. Because I was busy with other dinner preparations, my husband made the sauce. He loves to stir things so I figured he was perfect for the job — especially since the mise en place for the recipe was complete. Rub the beef at least 24 hours in advance. 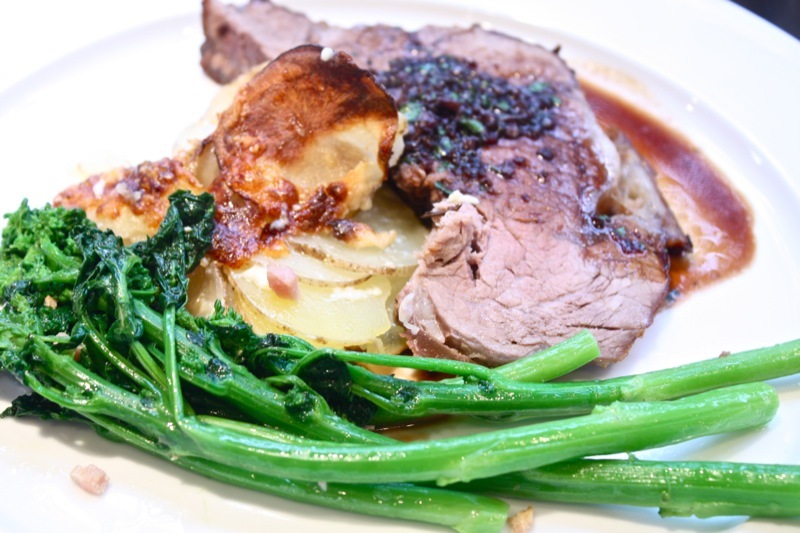 We enjoyed our Prime Rib and Bordelaise Sauce with Potatoes au Gratin and Rapini and an Asparagus Salad with Tomato Viniagrette from Gordon Ramsay’s Three-Star Chef. Thanks for your patience ahead of time on the recipes for those. All in good time. All in good time. Our roast was about 5 lbs. with the ribs still attached. I mixed 2 T prepared dijon with 1 T fresh rosemary, 1 T sea salt, and 1 tsp. coarsely cracked pepper and rubbed it over the top and sides of the beef. It was wrapped tightly in a plastic bag and refrigerated about 30 hours. Two hours before roasting time, I removed it from the refrigerator and let it sit at room temperature on my kitchen counter. I used a rack inserted in a small roasting pan to set the beef roast on. As with any recipe I choose when roasting a large piece of meat, I review general guidelines for internal temperatures and our preferred degree of doneness which is medium (my husband) to medium rare (myself). We plan for about 20 minutes per pound and use either the thermometer that can be plugged into my oven or an instant read thermometer toward the end of the cooking time. The most important thing to remember about preparing the beef with the bordelaise sauce is to begin the sauce just as the beef is coming out of the oven. You have to tent the beef with foil for about 25 minutes so that it can rest before carving so there’s plenty of time. A wide-bottomed sauce pan will help with the reduction. 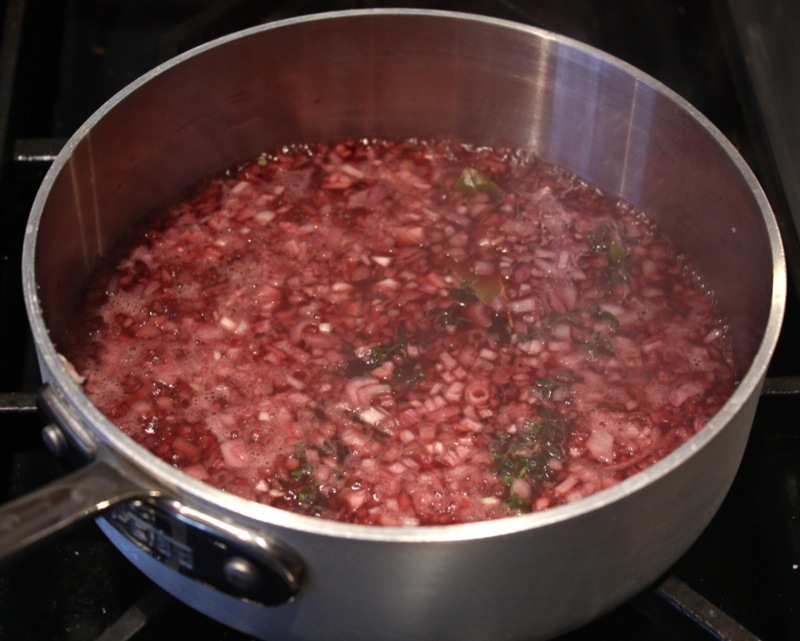 Combine shallots, thyme and bay leaf in a wide-bottomed sauce pan, pour in the wine and then reduce over medium heat until the wine is nearly completely evaporated. 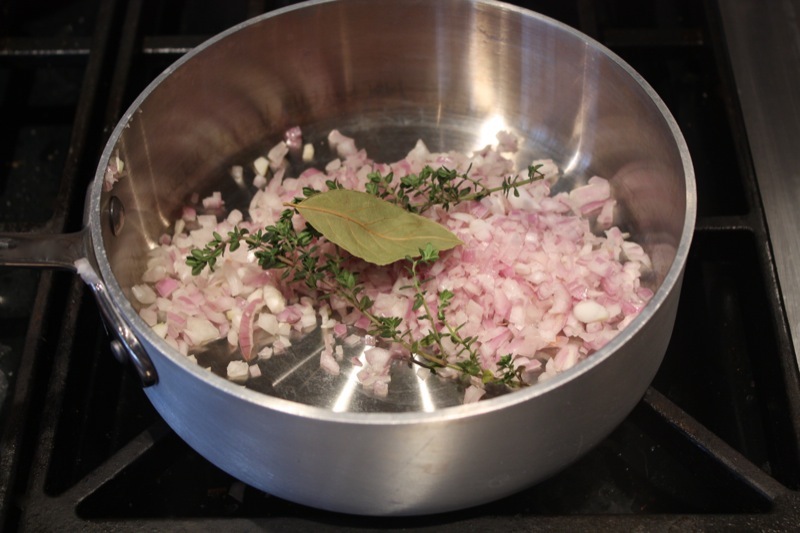 Toss the thyme and bay leaf and stir in the demi-glace. Sauce the beef as desired when serving, and pass the remainder for those who would like more. This was a very heady combination of flavors. The rosemary and mustard on the beef along with the rich sauce was interesting. Others enjoyed it, but I felt it was a bit strong, and I’m a mustard lover. Of course, I believe I also ended up with an end piece in the hustle and bustle of getting dinner on the table. 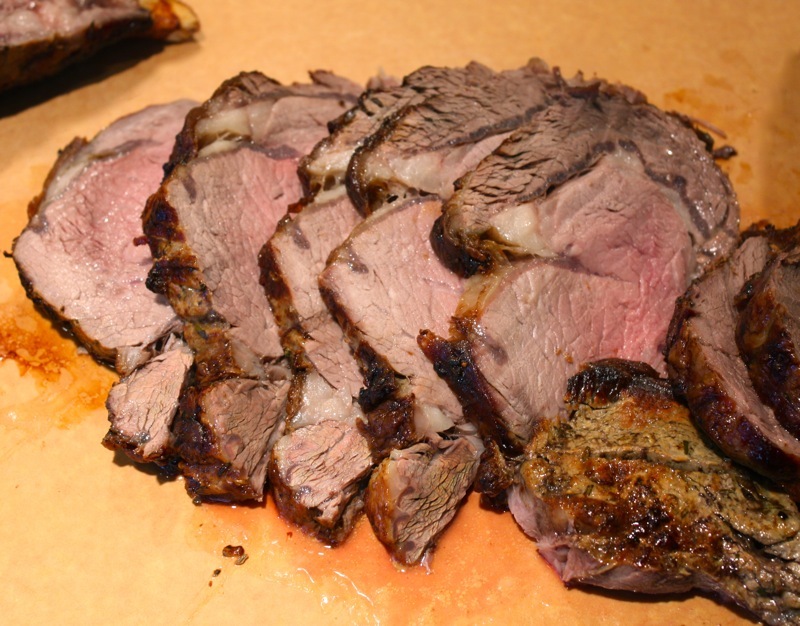 If you’ve not tried roasting meat using the technique in this recipe where the oven is initially very hot and then turned down very low, I highly recommend it. 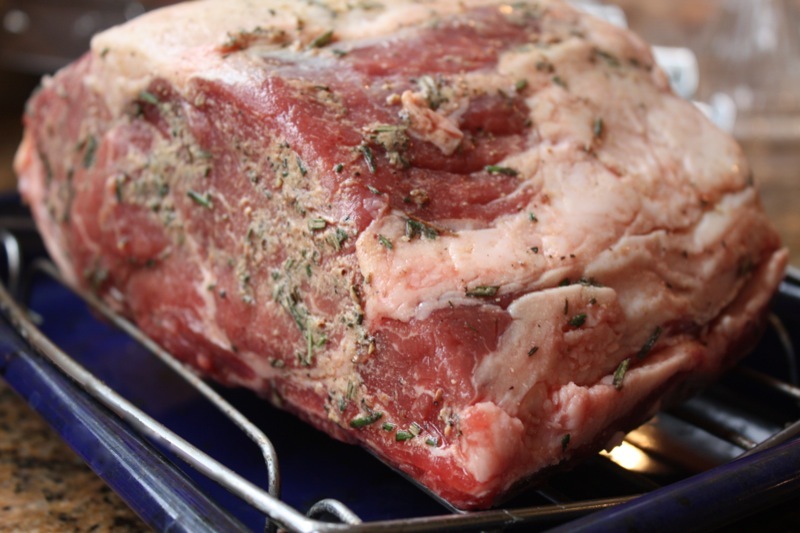 I’ve tried it many times, and we enjoy the texture it gives the exterior of the meat. The interior is always moist. For the bordelaise, I used Markham Cabernet Sauvignon even though the sauce is French and originated in the Bordeaux region, meaning I should have used a bordeaux. I’m just not that great at choosing French wine and when you live in California, it seems pointless to avoid the hundreds of labels I can choose from at a regular grocery store. The Cab was a bit pricey, but it was a special occasion and I knew I’d have some of the bottle left to drink with my meal. Generally, I choose a wine that I’d want to drink to use in a recipe like this, otherwise, the quality of the sauce will only be as good as that wine. 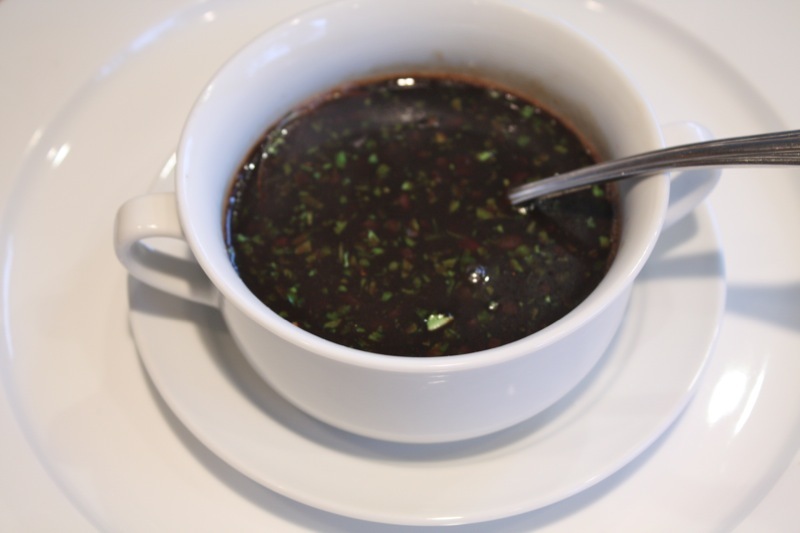 If you aren’t one to try making your own demi-glace just to try this sauce, then this recipe can also be made using Demi-Glace Gold. I’ve used it for years and enjoy the rich, but much more mild flavor than what my demi-glace renders. It can be found at specialty stores or at Amazon.